Print & Deliver Packages - Allow us to assist in developing your printed message and utilizing the correct delivery vehicle to reach maximum exposure. 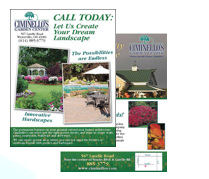 From postcards to 8.5” x 11” single sheet flyers to multi-page tabs to extended promotional pieces, we have the dedicated staff to create just the right message. Target your customers by zip code in Franklin County- Target the ones you know are best for your business, or we can help you analyze the market. Target desirable customers outside Franklin County by zip code clusters, designed from in-depth data modeling of consumer shopping, traffic, spending, and behavioral patterns. Front Page Sticky Notes - Dispatch and ThisWeek Sticky Notes, removable self-stick notes, give your advertising message premium exposure and help drive traffic to your business with front page presence. Offering full-run distribution in addition to zoning, you can strategically target your message where you need it most. Kraft Wraps - These high impact full pages are available on Thursday and Sunday and serve as the wrap around the insert packages. Midweek TMC - Reach desirable households that do not subscribe to the Thursday Dispatch by placing your inserts into the Midweek TMC delivered with ThisWeek Community Newspapers. TheBAG - Reach the masses of 800,000+ homes delivered each Sunday. Reach a high percentage of central Ohio residences or narrow your target audience. Advertising options include preprints in TheBAG, flyers that stick out of TheBAG, print & deliver options and even advertise in your own clear bag. 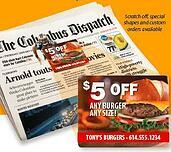 Deliver in combination with The Columbus Dispatch subscribers without duplication. Target by zip code, radius, homes only, geography, demographics, expenditure data from Nielsen, block group targeting or use your client database. Polybag - Wrap your ad around The Dispatch or TheBAG - using a custom-printed polybag, your message creates a big first impression with the morning paper. Solo Direct - This highly visible program delivers your product directly to the front door. This is a total turnkey production and delivery! 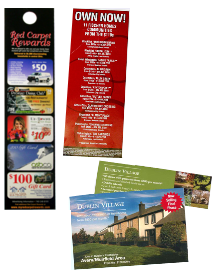 Address specific delivery at up to 50% of the cost of Direct Mail. We offer a vast array of targeting methods, or use your own business database. 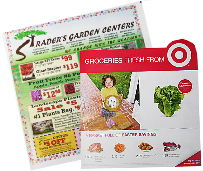 TheBAG SundaySavings - Target your printed message to thousands of consumers who want to seeyour ads, as they have “opted in” to receive this weekly package. Targeted at the zip code level, this footprint mirrors our most highly circulated Sunday Dispatch zip codes. Product Sampling - Have a small product to share? Let us deliver your magnets, key chains, and other small promotional items, targeted by zip codes or block groups. Subscriber Invoice Inserts - Dispatch Subscriber Invoice Inserts are an inexpensive way to get your message directly in front of our subscribers. Your message will be inserted into our subscriber’s invoices and delivered directly to their home.